Fritz Scholder, Luiseño, was born in Breckenridge, Minnesota, on October 6, 1937. His long and prolific career includes that of painter, sculptor, lithographer, teacher, mentor, and bookmaker. The style of Abstract Expressionism inspired his use of strong images and color. The style of Pop Art inspired his ideas of clichés and interest in popular culture. Scholder’s early awareness of art included his high school association with Indian artist Oscar Howe in Pierre, South Dakota, who had been exposed to contemporary art in Paris during World War II. Fate, as well, brought him to study at Sacramento City College in 1957, where Abstract Expressionism ran rampant in California and was a natural visual style for Scholder. He was granted a full scholarship to the Southwestern Indian Art Project at the University of Arizona in 1960, supported by the Rockefeller Foundation. In 1965, Scholder found his own students at the Institute of American Indian Arts in Santa Fe to be angry and alienated, as disenfranchised members of American society. Using Pop Art ideas, he attempted to break the long-held Indian clichés. 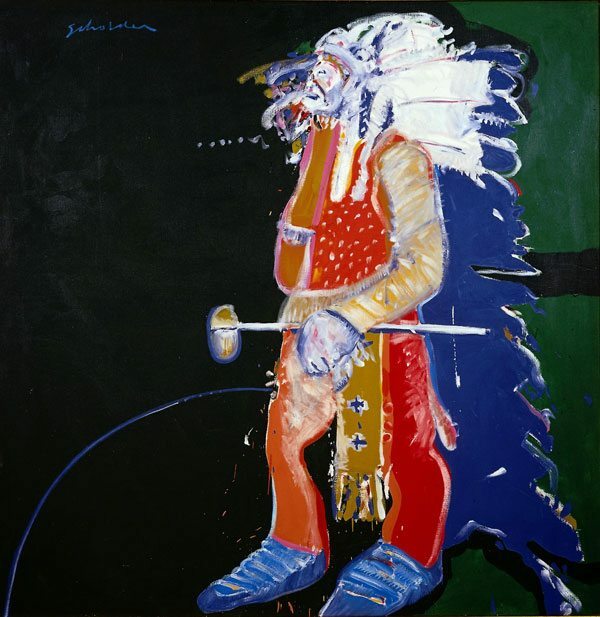 Fritz Scholder can be discussed as a Postmodernist for his use of “mass-culture social commentary.” He sought to “deconstruct” more than a century of romantic images of Native Americans and approach the American Indian in real terms. In 1970, Scholder began a collaboration with Tamarind Institute to produce lithographs of his Indians. Scholder’s work can be appreciated as being simultaneously Indian, American, and twentieth-century art. He has acknowledged his consciousness of Goya, Matisse, Picasso, and Munch. 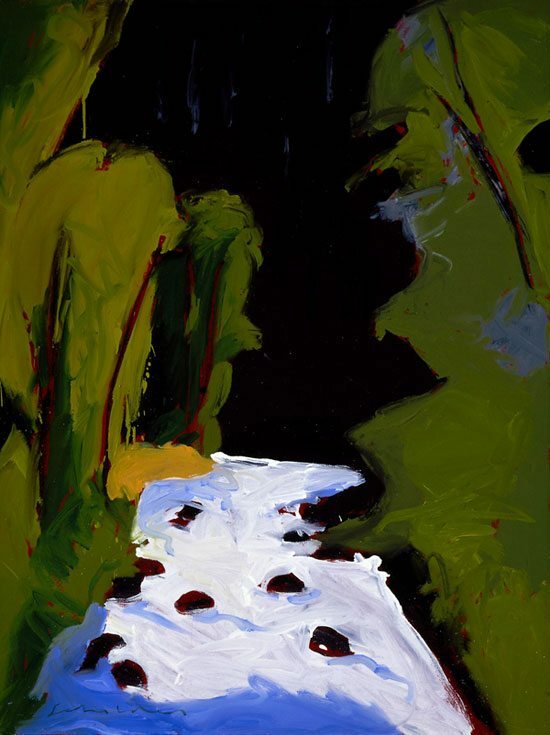 His work is also a complicated blend influenced by modern styles such as those of Jackson Pollock, Willem de Kooning, Francis Bacon, and Wayne Thiebaud. The human figure has been a central and continuing image for Scholder, mostly in the form of the female model in a range of poses and degrees of realism. His recent work contains mysterious forms of shaman figures and allegorical emblems. As well as extending his subject matter, he has continued to expand his technical capacities, most notably into the field of monotypes. Scholder died on February 10, 2005, at his home in Scottsdale, Arizona. Adams, Clinton. Fritz Scholder Lithographs. Boston: New York Graphic Society, 1975. Archuleta, Margaret and Dr. Rennard Strickland. Shared Visions: Native American Painters and Sculptors in the Twentieth Century. Phoenix: The Heard Museum, 1991. Broder, Patricia Janis. Leading The West, The Modern Vision. Boston: New York Graphic Society, 1984. Wilmerding, John, Jeremy Strick, and Richard Newlin. Fritz Scholder, Paintings and Monotypes. Twin Palms Publishers, 1988. 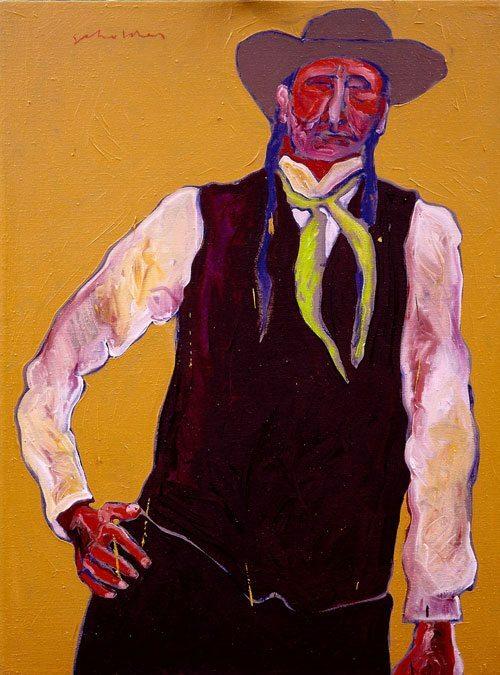 Prepared by Whitney Gallery of Western Art, Buffalo Bill [Center of the West], Cody, Wyoming, April 20, 2001.